In 2017, Manny Pina surprised a lot of people and became the regular starting catcher. Once Jett Bandy cooled off after a hot start, Pina took over the everyday role, and he had a productive season. In 369 plate appearances, he posted a TAv of .262, and BP’s defensive metrics rated him at just about league average defensively (-1.1 FRAA Adjusted). After having never gotten meaningful playing time at the major league level, he became a mainstay on the Brewers’ roster. Stephen Vogt also had a good year for the Brewers. He put up a .282 TAv in 129 plate appearances with Milwaukee, and he became Pina’s regular partner behind the plate once he came over from Oakland. He was also solid defensively according to BP’s metrics (7.2 FRAA Adjusted), but his 14 percent caught-stealing rate stood out as a flaw. So far this offseason, the Brewers have brought both players back. Pina is still in his pre-arbitration years and is under team control through 2022, while Vogt is into arbitration and is under team control for two more seasons. Vogt is relatively expensive (at $3 million per year) given what he provides, so the Brewers did have a decision to make about whether to tender him a contract. They did so, though, and the $3 million price tag suggests that he is not a candidate to be designated for assignment unless he struggles mightily to begin the season. Working off the assumption that both will be on the roster for much of the season, then, the follow-up question is how playing time will be divided. Pina hits right-handed and Vogt hits left-handed, so a straight platoon would make some sense on the surface. Vogt’s inability to hit left-handed pitching supports this idea, as his career .593 OPS against lefties is quite poor. Pina, though, has a reverse platoon split; he has posted a .768 OPS against righties and a .677 OPS against lefties. Just using Pina against lefties would negate some of his value. Defense is also a question. As mentioned above, FRAA rated Vogt as a positive behind the plate last year, but that had never before been the case at the big league level. As Jeff Sullivan explored recently at Fangraphs, catcher framing, which is a large percentage of catcher FRAA, has become increasingly volatile. At this point, it seems fair to say that we cannot be sure how accurately catchers’ defensive values are being captured. There are many possible explanations, as Sullivan outlines in his article. One of those, though, is that everyone is better at it than they used to be. If that is the case, then prior knocks on Vogt’s defense (-10.8 framing runs in 2016 and -8.9 in 2015) are discounted. Pina does not have a long enough track record in MLB for us to look at his prior defensive data for any guide. Last year, he was a -3.5 in framing runs, where Vogt was a 0.0. As mentioned above, though, it’s increasingly unclear how predictive those numbers are. We cannot be completely confident that public catching metrics are as accurate as we trust offensive ones to be. I am sure the Brewers have their own internal catching data that are more complete and accurate than are the public models. Using that information, they will have an idea about the defensive strengths and weaknesses of each of their catchers. At the very least, they have professional scouts whose job is to evaluate the physical skills of baseball players. I, obviously, do not have access to those reports, and so I don’t know which of the two the club prefers. Vogt’s throwing problems are a visible issue, but the most glaring problems are not always the most significant. 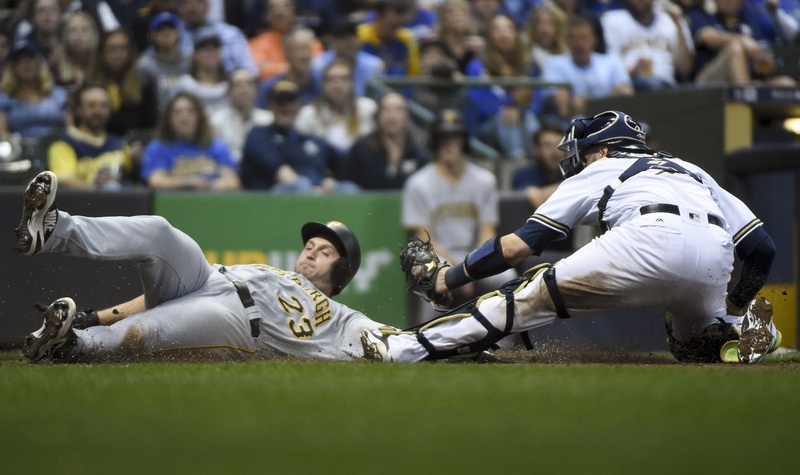 Stolen bases do not happen that often, regardless of who the catcher is, so any framing, blocking, or pitch-calling skills would be weighted more heavily in Craig Counsell’s decision-making processes. Deciding which player will get more plate appearances next year requires some guessing. Pina was the better player in 2016, but he is already 30 and so is not a long-term project who needs developing. Because neither player is clearly better, I would expect the playing time split to be about 50/50. Vogt’s platoon splits means that Pina should play against every lefty, but Pina’s excellent 2016 likely earned him enough goodwill to take some of the playing time against righties as well. I’m probably the only one that reads things that closely, but just a heads up, the headline is solid now, but it still mentions 2016 in the article itself.